Salmon Tataki- Hello everybody, welcome back with ZetiraKitchen! Today i will share about How to Make Japanese Food Salmon Tataki with Sesame Seeds. Salmon tataki is almost like sashimi. Only Tataki needs to be stung briefly with a medium heat to form the outer texture. And the inside, texture of Tataki is still raw. Uniquely Tataki has its own sauce to serve. The sauces made from vinegar, ginger, and added other seasoning to make more delicious taste of Tataki. Moreover, beside has nice tasty, Salmon has some profit for our body. Salmon was popular with the benefit. Like, has very good source of easily digestible proteins (amino acids), and fatty acids like Omega-3s in the form of triglycerides, as well as vitamins like vitamin A, vitamins and some members of the family vitamin B choline, pantothenic acid, and biotin. And salmon that rich of contains minerals like selenium, zinc, phosphorus, calcium, and iron. Let's to start it! Pour some vegetable oil in your pan with medium heat. Then put your fresh salmon. Turn around the salmon in all sides. It must do in 5 minutes. The salmon will be raw in the middle. If it done, you can take your salmon and placed into the plate. Immediately put your salmon into fridge until cold (30 minutes). Now we make the marinade for salmon. chopped the spring onion and mix with freshly grated ginger to a small cup. Then add the soy sauce, fish sauce, lemon juice, rice vinegar and 2 tablespoons of cold water. And stirring until mix well. Add extra sesame oil, fish sauce, soy sauce,and lemon juice into marinade.Mix it again. Bring salmon tataki from your fridge then slice the salmon tataki into thin slices. 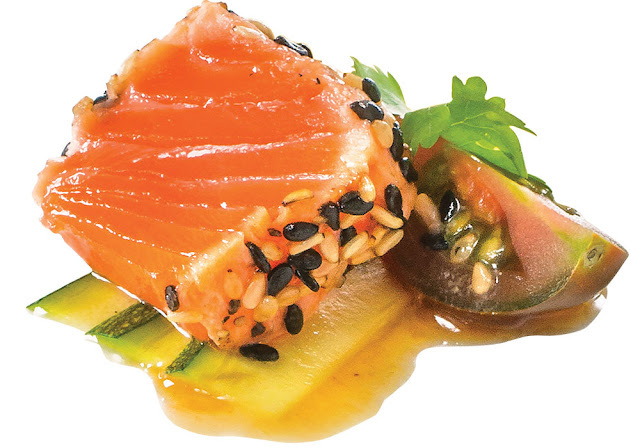 Drizzle the salmon tataki with the marinade. Serve chilled.